B vitamins play an important role in the metabolism of carbohydrates, fats and proteins and are essential components of enzyme systems that drive the body to form energy from foods to generate new cells. They are necessary for the proper function of the brain and nervous system, production of red blood cells and the healthy maintenance of skin, hair, eyes, mouth, mucous membranes, intestinal muscles, heart and the liver. 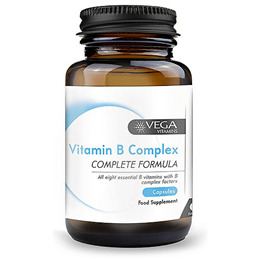 Below are reviews of Vega Vitamins Vitamin B Complex - 60 Capsules by bodykind customers. If you have tried this product we'd love to hear what you think so please leave a review.